Several former Algerian international footballers have called for an investigation into whether their children's disabilities could be linked to medication given them in their playing days. Eight former Algerian internationals have handicapped children, former defender Mohamed Chaib told AFP. "We have serious doubts over the effects of medication that we were given during training camps," said Chaib, a father of three girls all born with muscular dystrophy. "We just want the truth." One daughter died in 2005 at age 18 as a result of the disease, he said. He and his wife were given a series of tests but no abnormalities were found. 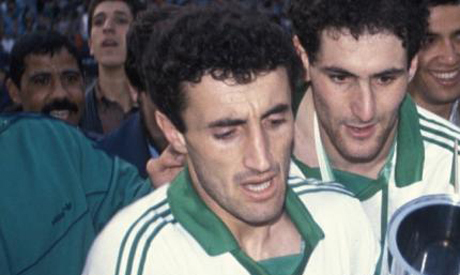 The players all represented Algeria in the 1982 and 1986 World Cups. Many football fans remember the team's shock win over West Germany in the first round of the 1982 competition. The players' claim, however, was met with skepticism by Ali Fergani, captain of the "Desert Foxes" during the 1982 cup in Spain. "The number of players who are parents of disabled children is minimal compared to the total number of players selected," he said. Players said they could not recall the names of the medications they suspect may have caused birth defects. Some said doctors never gave them their medical files, the El Watan newspaper reported. Djamel Menad, a striker in the 1986 cup, said his daughter born in 1993 suffered from agenesis of the corpus callosum, a condition that causes seizures and muscle weakness. Menad said it seemed unlikely to be a coincidence that several other players his age had children with disabilities and blamed the medications doctors handed out. "Since I discovered I was not alone, I began to ask myself questions," he said. Menad thinks its possible there is a link between the medicines and tonics doctors gave players. "They gave us drugs and vitamins to battle for energy loss after training and matches," Menad said. But Fergani said the only substance he recalled being given was Vitamin C.
Former midfielder Mohamed Kaci Said, the father of a 26-year-old disabled daughter, also wants an investigation. "Doubts persist until an enquiry has been opened and the truth told," Said told newspaper El-Khabar. He said he was shocked when his daughter was born and some thought he and his wife may have been related, but he stressed his wife is of Turkish origin. Former midfielder Said said that foreign medical staff with the team may have been using players as guinea pigs to test drugs but Fergani insisted that all team doctors were Algerian. Sports authorities in the former Sovet bloc have been found to have administered drugs to athletes without their knowledge in the 1970s and 1980s. Algerian authorities have not commented on the allegations.